"I prefer death in Christ Jesus to power over the farthest limits of the earth. He who died in place of us is the one object of my quest. He who rose for our sakes is my one desire." In 107, during the reign of the brutal Emperor Trajan, this holy Bishop was wrongfully sentenced to death because he refused to renounce the Christian faith. 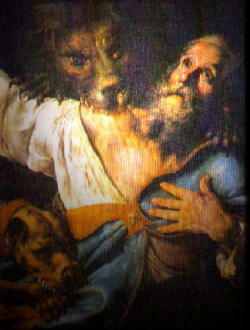 He was taken under guard to Rome where he was to be brutally devoured by wild beasts in a public spectacle. CHESAPEAKE, Va. (Catholic Online) - The second Bishop of Antioch, Syria, this disciple of the beloved Disciple John was consecrated Bishop around the year 69 by the Apostle Peter, the first Pope. A holy man who was deeply loved by the Christian faithful, he always made it his special care to defend "orthodoxy" (right teaching) and "orthopraxy" (right practice) among the early Christians. The content of the letters addressed the hierarchy and structure of the Church as well as the content of the orthodox Christian faith. It was Bishop Ignatius who first used the term "catholic" to describe the whole Church. These letters connect us to the early Church and the unbroken, clear teaching of the Apostles which was given to them directly by Jesus Christ. They also reveal the holiness of a man of God who became himself a living letter of Christ. The shedding his blood in the witness of holy martyrdom was the culmination of a life lived conformed to Jesus Christ. Ignatius sought to offer himself, in Christ, for the sake of the Church which he loved. His holy martyrdom occurred in the year 107. In his pastoral letters he regularly thanked his brother and sister Christians for their concern for his well being but insisted on following through in his final witness of fidelity: "I know what is to my advantage. At last I am becom¬ing his disciple. May nothing entice me till I happily make my way to Jesus Christ! Fire, cross, struggles with wild beasts, wrenching of bones, mangling of limbs-let them come to me, provided only I make my way to Jesus Christ. I would rather die and come to Jesus Christ than be king over the entire earth. Him I seek who died for us; him I love who rose again because of us." "I am God's wheat and shall be ground by the teeth of wild animals. I am writing to all the churches to let it be known that I will gladly die for God if only you do not stand in my way. I plead with you: show me no untimely kindness. Let me be food for the wild beasts, for they are my way to God. I am God's wheat and shall be ground by their teeth so that I may become Christ's pure bread. Pray to Christ for me that the animals will be the means of making me a sacrificial victim for God. No earthly pleasures, no kingdoms of this world can benefit me in any way. I prefer death in Christ Jesus to power over the farthest limits of the earth. He who died in place of us is the one object of my quest. He who rose for our sakes is my one desire. The time for my birth is close at hand. Forgive me, my brothers. Do not stand in the way of my birth to real life; do not wish me stillborn. My desire is to belong to God. Do not, then, hand me back to the world. Do not try to tempt me with material things. Let me attain pure light. Only on my arrival there can I be fully a human being. Give me the privilege of imitating the passion of my God. If you have him in your heart, you will understand what I wish. You will sympathize with me because you will know what urges me on. The prince of this world is determined to lay hold of me and to undermine my will which is intent on God. Let none of you here help him; instead show yourselves on my side, which is also God's side. Do not talk about Jesus Christ as long as you love this world. Do not harbor envious thoughts. And supposing I should see you, if then I should beg you to intervene on my behalf, do not believe what I say. Believe instead what I am now writing to you. For though I am alive as I write to you - still - my real desire is to die. My love of this life has been crucified, and there is no yearning in me for any earthly thing. Rather within me is the living water which says deep inside me: "Come to the Father." I no longer take pleasure in perishable food or in the delights of this world. I want only God's bread, which is the flesh of Jesus Christ, formed of the seed of David, and for drink I crave his blood, which is love that cannot perish. I am no longer willing to live a merely human life, and you can bring about my wish if you will. Please, then, do me this favour, so that you in turn may meet with equal kindness. Put briefly, this is my request: believe what I am saying to you. Jesus Christ himself will make it clear to you that I am saying the truth. Only truth can come from that mouth by which the Father has truly spoken. Pray for me that I may obtain my desire. I have not written to you as a mere man would, but as one who knows the mind of God. If I am condemned to suffer, I will take it that you wish me well. If my case is postponed, I can only think that you wish me harm."